Everyone flocks here for the amazing weather and awesome attractions. Visit San Diego in the off season and beat the crowds. We camped our last time there and enjoyed an amazing family vacation. These are just a few of the interesting attractions of Southern and Central California, but there are many other places of interest to choose from. It’s all a matter of deciding how much time you plan to spend in this wonderfully diverse state. Family travel can be green travel as well. We had a blast staying at the San Diego Metro KOA for our kids’ fall break. It was a cost-effective way to visit San Diego in the off season. The campground was fairly empty, and the weather was great. There’s a ton for kids to do at this KOA. It’s also located so it’s convenient to major San Diego attractions. This KOA has beautiful grounds and accessible, friendly staff. It was clean and felt very safe. We wanted a quick getaway for a few days. We live in Tucson, and our kids have a week-long, mid-October fall break. San Diego is a convenient choice for Arizona residents. Many families in Tucson take advantage of their proximity to California, and San Diego in particular. It’s a 6 – 6.5-hour drive which makes it doable even for a long weekend. Sometimes us desert-dwellers just need to see the ocean. It’s always great to play at the beach for a few days. Peak season is expensive everywhere, of course, and hotels located on or near the beach are expensive year-round. We thought we’d try camping in San Diego for our October excursion. Over the summer, my husband and son camped at Silver Strand State Beach for their Boy Scout sailing trip. They also had the opportunity to stay overnight on the USS Midway! On their last night, they stayed at the KOA in San Diego. Everyone on the trip wished they’d had more time there. I thought beach camping at the state park sounded fantastic. My husband thought it was fine but that there were better choices where you wouldn’t have to deal with all of that sand and the not-so-great restrooms and showers. He raved about the San Diego KOA, their grounds, and the amenities. My son really wished he had more time to hang out there. 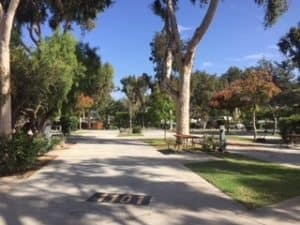 So, when we were planning our fall break – a last-minute trip – we chose to stay at the San Diego Metro KOA. The address is 111 N. 2nd Ave in Chula Vista, California. We were there for four days and wish we had more time to enjoy all the amenities at KOA. Even if you stayed at a luxury hotel, you wouldn’t have all of these choices. What families will love is that there are things to do for older children who are often “bored” on vacations. The camp was laid out nicely, and we very quickly found ourselves feeling like it was home. They even allow your dog to come camping with you. They have a well-maintained outdoor court with two nets. Even your little ones will be able to shoot with the adjustable nets. This is a great way for kids to interact with other kids too as they can have fun playing basketball or other games. We brought our own basketball but learned when we got there that you can borrow one from the desk with an ID. Next to the basketball court is a big grassy field with a path surrounding it. You can bring a soccer ball, a football or croquet. The kids will have fun running around too. There are two large jumping pillows. One is for younger children and the other is for older kids. Or bring your own bike. We saw kids on skateboards, roller blades and families with their own bikes and wagons. You can rent a variety of non-traditional bikes: 3-wheel, 4-wheel and 2 – 6 person bikes. These are great for families and extended families to explore the campground and spend time together. You can rent them by the half hour or hour. 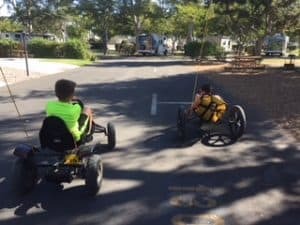 You need to be careful and mindful of cars but there are all of these “streets” within the campground which make it super-fun for kids to explore and get exercise while they are in a contained area. If you visit here in the off-season, your kids will have an even better time cruising the streets. My kids and I rented bikes and had fun playing hide and seek on bikes on all the different roads throughout the campground. Each bike has a raised flag attached to make it easier for vehicles to see them. I was thrilled to see there was a pool table and air hockey in the arcade room, not just video games. This was a fun way to spend time with my kids and teach them billiards which they don’t get to play regularly. There are a few video games as well but it isn’t overwhelming. You can rent the billiards with an ID and for a very nominal fee. There is a smaller one by the restrooms and a larger one by the pool. The larger one also has a covered area with picnic tables and room to run around. Families and groups will have fun hanging out in this section. This is next to the game room. You will come in here to check in and check out. This is also where you rent bikes, billiard equipment and more. It’s a fairly large shop with fun souvenirs. If we didn’t live in Arizona with our own swimming pool, we probably would have made time to use the pool. We swam in the ocean though so we didn’t want to swim again when we got back to camp. It’s a large pool with a hot tub off to the side. Adults can enjoy the evening, adults-only times for the hot tub. They will be closing this area when the new, larger aquatics center is finished. They are in the process of building a huge aquatics center. This will be an extraordinary space, comparable to fine hotels. If you didn’t want to leave the KOA grounds before, you really won’t after lounging in a chair or hanging out under one of their canopies. They are also including many green features. This area will also feature a workout area and new women’s and men’s showers, laundry facilities, meeting room, and more. There is a fee for this activity and certain hours. We didn’t check it out because we were busy with other activities but it would be a fun thing to do. You purchase the pass for the day and enjoy climbing when you want to. We didn’t eat here because we brought our own food, but there is food and beverages for sale, including alcohol. Depending on the day, you might be able to enjoy a wine and beer tasting. There’s also an outdoor shooting gallery here that we saw but didn’t try. We were told when we were leaving that there was ping pong and horseshoes there too. We didn’t even see it but how fun that would be! You can borrow the equipment at the desk with your ID. There’s so much to do while camping in San Diego! These activities are the one thing you might miss if you visit here during the off-season. They have family fun activities year round but on a limited basis. We arrived on a Sunday and weren’t able to enjoy any of them. It was fine as we had plenty to do. But if you are there for the full weekend or during the high season during the week, you might be able to enjoy tie-dye, cookie decorating, hay rides, flashlight lollipop hunts, movie nights, playing laser tag, barrel train rides, family games, story time, and so much more! The KOA will email you a few days in advance of your arrival so you can plan what you will be able to do. They really offer some cool activities… again, especially when it’s difficult sometimes to please tweens and teens. I’m sure my kiddos would have loved it. The best part about all of these kids’ activities is that kids can be outside. They can do more than just sit in a hotel room watching TV or staring into a screen. They can choose from a lot of things to do. The grounds are beautiful with trees, and it’s very clean. When we went to San Diego this trip, we were either enjoying time at the KOA. Hanging out, playing at one of the above activities, preparing meals, eating, or around the campfire — or at the beach. We didn’t even visit any of the San Diego attractions which were so close. We wanted to maximize our time at the KOA. This made it very cost effective for our family. 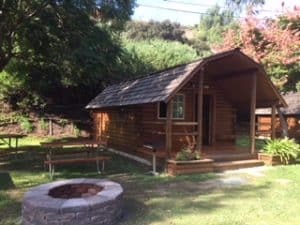 Our expenses were gas to get there, our KOA accommodations, renting bikes and playing in the game room at KOA, and the nominal parking fee at the beach. We brought our own food so we didn’t have the expense of eating at restaurants, which is a greener way to travel, too. What’s great about this way to camp in San Diego is that there are different ways you can stay. This makes it viable for families on a budget as well as for those who want more of a glamping experience. No matter which option you choose, you still get to enjoy all of the amenities there. Your kids will have a fantastic time with all there is to do. All of these options means there are different price points. You can bring your own tent, the least expensive option, and still enjoy all of the amenities as people spending a lot more for the deluxe cabin. Also is great is you can have all of the benefits of camping. The campfire, spending time making meals and enjoying time together. Without investing in and bringing all of your own camping equipment. They offer full hookups with different options to choose from. Maximum length is 70 feet. The deluxe cabins at KOA have a bathroom with shower and partial kitchen. Sleeps six and includes all linens; has TV and DVD player. This is a great mix for families who want to cook all of their own meals. You will enjoy relaxing on the porch and around your own fire ring. There’s even a gas grill. Some cabins offer a sleeping loft. There’s also an ADA accessible deluxe cabin that sleeps four. We chose this option and absolutely loved it! We saw two of these on the property. These tents will be taken down and redone. They will be true eco-tents with solar and more. They will be on raised platforms. Based on safari tents in Africa, our safari tent had four beds and slept six. There was plenty of room to walk around and stand, with a very high ceiling and a wooden floor and seven windows. 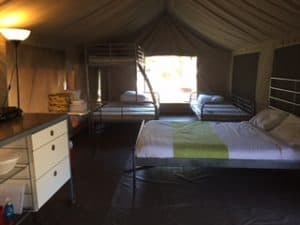 The eco-tents are in the perfect location on the property with easy access to the showers and restrooms and even closer to the Kamper Kitchen. We loved sitting around our fire ring and at our own picnic table. There was a grill too but we used the electric one at the kitchen. We thought this safari tent was awesome and were stunned to learned they will be replaced with even better ones. We are looking forward to visiting again when these are completed. Sleeps up to six people; need to bring linens; no kitchen. Outside you will enjoy the picnic table, porch with swing, and fire ring. You will need to bring linens and towels, etc. There is a porch with a swing, your own fire ring and picnic table. Like all the other options, you also have options even when it comes to tent camping at KOA. There are tent sites with electricity and water and those without. Some sites have sand, mulch or grassy areas. The Kamper Kitchen at KOA makes it easy for you to cook meals. There are three workstations, each with an electric stove top and a double sink. This area also has a large propane grill; propane included. This area was very clean. Most guests cleaned the water that inevitability splashed when they washed produce or cleaned their dishes and pots, etc. The only things this area could benefit from would be a recycling bin and some towels to wipe down the sink areas. Many people did clean up after themselves but many did not. This area is lit up at night as well. I was asleep so I’m not sure if it was lit all night. Quiet hours are 10pm – 7am. The people around us all kept to these quiet hours. There are BBQ grills at most sites as well. There are also large sinks to wash pots and pans near the restrooms. The restrooms and showers were very clean, well-lit and in a good location. Again, we were there off season so everything was very pleasant; there weren’t lines, noise, crowds or chaos. This San Diego KOA was in a convenient location to many beaches and attractions. Because of this, it really makes it a fantastic choice for visiting San Diego in the off season or anytime. We didn’t see any recycling cans on the property, and there weren’t any by the Kamper Kitchen. There may have been recycling at other areas in the park but we didn’t see them. Also in the Kamper Kitchen, we would have liked to see a can or something to dispose grease. I would imagine campers are pouring it down the sinks, in the plants or in the garbage. Bring a basketball, scooter, skateboard — whatever your kids excel at — and a helmet. They will have fun being outside in somewhat unstructured activities while the adults can relax, visit and prepare meals. We are excited to return soon when their new pool area is completed. It seems like it will be a high-end pool experience. There will also be upgraded showers, restrooms and laundry facilities as well as a meeting room and workout room. We are hopeful this KOA remains a place for green travel. Camping is great way to enjoy green travel. You reduce your impact on the environment when you cook your own meals at your site. When you make one trip out for groceries and cook your meals onsite, you greatly reduce emissions, waste and may even eat healthier. Brought our own reusable water bottles. Refilled water from KOA sinks. Brought food instead of eating in restaurants and fast food places. Brought our own reusable plates and cutlery not realizing our safari tent (soon-to-be eco-tent) included them for use. Enjoyed simple things like preparing meals, eating meals together and cleaning up together afterwards instead of major attractions. Going to this KOA was a welcome change from the commercialism is staying in hotels. It’s a much greener way to travel as well. Usually at the end of a day or sightseeing we would come back to our hotel room and turn on the TV. Here, we left the electronics at home and enjoyed playing outside, electronics-free. Usually we spend a lot of money staying in a hotel and are barely there. At KOA, you will want to stay there and hang out — it’s all part of the experience. The kids will have a great time. It’s a wonderful place for families and groups. While it’s a big vacation for others in the country to go to San Diego, living in Tucson we feel it’s practically in our backyard. When the kids have a long weekend from school or a few days after the break, it’s great to be able to just drive on over to San Diego. Often we don’t need to plan it out like we would if we were flying. We just pack our suitcases and go. We’ve traveled from Tucson to San Diego two other times for our kids’ school breaks. It’s a great way to experience San Diego without the crowds. The first time we went was for our kids’ rodeo break, a four-day weekend at the end of February. We went to Legoland California for two days and spent time at the beach. The second time was like this trip, over fall break in October. Our kids took surfing lessons, and we all enjoyed the beach. We really enjoy visiting San Diego in off-peak, less crowded times. We are lucky in that our kids’ school has non-traditional school days off. Many families in Tucson, and probably in Arizona statewide, take off to California to enjoy theme parks, national parks, and the beach. Aside from the scouts trip, the other times we visited San Diego, we stayed in hotels. This time we wanted to camp and to travel more green. We were also able to save money by not staying in a hotel. We also saved money by bringing our own food and not eating in restaurants. If you can swing it, it’s a good idea to visit San Diego in the off-season. If you are going to an attraction, they are a lot less crowded. They are often less expensive too. Many attractions raise their rates during peak seasons and holidays. The San Diego Kids Go Free offer runs in October. It depends on the attraction, but most offer free admission to children with a paying adult. When you visit San Diego in the off season, you can take advantage of great deals. There are so many opportunities to explore art, archaeology, history, architecture, botany, music, photography, science and more in San Diego. Depending on how often and how many times you stop, you can usually make it from San Diego to Tucson in about six and a half hours. Door-t0-door from our home to the Metro KOA in San Diego is 419 miles. There are some unique tourist sites to explore along the way, if you have time. There is Rooster Cogburn Ostrich Ranch along I-10 in Picacho, Arizona where you can see and feed ostriches, goats, donkeys, stingrays, and even rainbow lorikeets, a type of parrot. You can also tour a monster truck. Yuma, Arizona is also a great stopping point. It’s about 180 miles from San Diego. It’s a great rest stopping point to refill gas and get some food to break up the drive. Many families traveling from Tucson to California may opt to spend the night in Yuma. In Yuma, you can visit the Territorial Prison for a tour. The Territorial Prison was built in 1876. You can learn about the prisoners and see the conditions here. You will even get to go in prison cells. We brought our kids here when they were eight and ten years old, and they enjoyed it. We had a guided tour but there are self-guided tours as well. There is a well-organized inside museum filled with history. You will also want to check out Martha’s Gardens Medjool Date Farms. Be sure to get a world-famous date shake or other date products. We had a fun and relaxing trip. It was the type of vacation that afterwards, you don’t feel like you need a vacation; you actually feel like it was relaxing. It’s a wonderful place for kids, especially over five. You will really enjoy it if you visit during the off-season when it’s much less crowded. Your kids will have a ball safely riding around the KOA roads and around the grassy area by the basketball nets. You could easily make this your big yearly vacation — in a cost-effective way. Go to the beach, then at KOA you can swim at the pool, play at the playground, enjoy a nightly campfire, jump on the jumping pillow, bring your scooters and bikes to ride around. The fun is pedaling through camp more than the bikes themselves though they are very unique and fun. Just know it will add up quickly if your kids want to do this everyday. From seeing all of the maintenance workers cleaning and up-keeping the property/grounds and cabins, bathrooms, and kitchen, you can tell this KOA is a large employer. The staff was friendly as well. 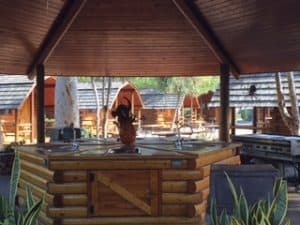 You will enjoy staying at this San Diego KOA. When we weren’t at the beach, we were at our eco-tent, preparing meals, or having fun exploring the grounds which made it a very cost-effective vacation to San Diego. We saved money and traveled green by not eating out in restaurants. We loved visiting San Diego in the off season to avoid the crowds. The KOA is in a convenient location, with easy access to major San Diego attractions and tourist destinations and several beaches. We are eagerly awaiting the chance to stay in their new eco-tents and to check out one of their cabins as well. We felt like we were a world away from our regular lives. We care about sustainability and want to travel green as much as we can. 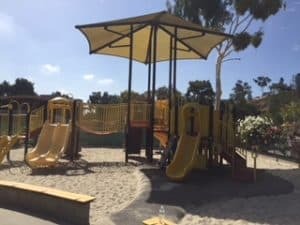 On our trip to Legoland California, we stayed at the Grand Pacific Palisades in Carlsbad, which was a quick, easy walk to Legoland. Not only did we save on parking fees at Legoland, we enjoyed more eco-friendly, green amenities than we’ve seen in a hotel in a long time. Why is this resort and hotel successful in their green initiatives? They make it easy for their guests to participate. There are convenient recycling bins. There are signs in the lobby restrooms, in the elevators, and in the guest rooms which encourage green travel. Even our kids were pointing them out. Guests are much more likely to participate in eco-friendly activities when they’re quick and convenient, and they are actually asked to do it. Now that this has become almost second-nature to guests, some proactive hotels and resorts are introducing even more ways to travel green. One of Grand Pacific Palisades’ most interesting initiatives is their toiletry donation program. It makes such perfect sense, and we were interested to learn more about it. In your room, you will find the usual toiletry items: shampoo, conditioner, lotion, body wash, and two bars of soap, one for the bathroom sink and a slightly larger one for the shower…but I would recommend bringing your own Best Travel Hair Dryer. To be a truly green hotel guest, you would bring your own from home and not use them at all. But typically, most guests open and use one of more of these personal care products. Grand Pacific Palisades donates leftover toiletry items. And during a short stay, you won’t use these five items in their entirety. Whatever is open and left is thrown away and is wasted. At best, you might be able to recycle the bottles. Until now…. Grand Pacific Resorts partners with Clean the World, an organization which collects and donates partially-used toiletries items that guests leave behind. According to Wagner, one of their challenges is education and about adopting new habits. The impact their resort in Carlsbad has made so far is impressive. “In 2017, we recycled 2,500 pounds of used toiletries, giving Clean the World the ability to distribute nearly 8,000 bars of soap to poverty stricken countries around the world,” according to Gaby McCray, Grand Pacific Resorts’ Senior Marketing Coordinator. We learned of this program before our visit to the resort but we didn’t see any information about it in the room or in the lobby. Therefore, the only thing which would make this better would be if they were to promote this program in the room itself. They could put in on a small sign in the bathroom, next to the toiletries, or include it on a small card with the room literature. We always thought we were being helpful by throwing away our used soap so the housekeeping staff wouldn’t have to handle it. However, being they are not allowed to touch it, in this case, it would be useless. We never would have known about this program had we not asked about their sustainable practices in advance. This is really a unique and easy program for guests to participate in. We hope more hotels will start doing this so it will become second-nature like other green hotel practices. The housekeeping staff isn’t allowed to pick these items out of the trash, even if they are on top. So it’s important for guests to leave them out on the counter. There are so many ways this hotel makes it easy for their guests to go green when staying here. Right away, we noticed all of these ways to green our hotel stay. There is recycling right outside when you pull up to the Grand Pacific Palisades — just on the other side of the posts so it’s not unsightly. It’s so convenient for those of us who’ve made a road trip and want to empty our cars of food wrappers, paper, plastic containers and bottles, etc. Recycling right outside when you check in. There are many options to recycle inside and outside Grand Pacific Palisades. We were surprised by the great number of recycling and garbage cans in the parking area. It was very convenient to recycle aluminum, plastic, and paper in their separate containers. After a day at the beach or sightseeing, vacationers usually have brochures, park maps, fast food packaging, and more to dispose of. Having these convenient receptacles for easy sorting and recycling make guests much more apt to do it. They have a free hotel shuttle which will take you within a five mile radius. When we checked in and asked about it, they told us we could call to arrange a pickup with 30 minutes’ notice. So many times, hotels have their shuttles idling outside, waiting for guests. We were happy to learn that at Grand Pacific Palisades their shuttles don’t sit running, waiting for guests who may or may not need services. It makes so much more sense this way and is so much better for the environment. And really, when we walked on our first day to Legoland and saw how close it was, we didn’t bother to call the shuttle for a return pickup. Walking is a great way to travel green. There were convenient recycling bins by the family pool area and splash pad and throughout the grounds. It’s rare to see these fantastic bins which separate out the recycling, but there were so many of them here. They really take their recycling seriously and make it a priority. While the elevators are easily accessible, the staircase is right in open view in the lobby, conveniently located by the concierge desk. The stairs beckon guests to enjoy the floor-to-ceiling windows showcasing the Olympic-size adult pool and incredible views of the city and the Pacific Ocean in the distance. It’s always a green practice to take the stairs instead of riding the elevator. We took some time to enjoy the spacious lobby playing games and hanging out. You will find convenient recycling in the lobby as well. The concierge area has the San Diego Union Tribune for guests to enjoy. Remember back in the day, when hotels would leave a newspaper outside of every guest door? It’s nice now that there is less waste. They also offer water with limes and lemons with small recyclable plastic cups with a garbage can to recycle them right there, just inches from the cups. It was so convenient for someone who wanted to take a small drink to then recycle their cup. They offer reusable pool wristbands instead of paper ones for access to the pool. Signs in the elevators ask guests to conserve energy and then gives them specific examples of how to do it. Throughout the hotel, in the elevators and public restrooms, you will see signs encouraging guests to Tweet the ways they are going green with #goinggreen. These eye-catching and attractive signs definitely influence guests to make green choices. Signage politely reminds guests to turn off the lights and adjust the thermostat when they leave their rooms, and to reuse their towels. Once you are in your room, there are more ways for you to minimize your impact. While we’ve declined housekeeping services before during other hotel stays, we’ve never been compensated to do so. If you are staying for more than one night, you can decline cleaning service the next day. We’ve done this before on trips. To travel green but mostly because we didn’t want cleaning staff in our room because of our electronics. We’ve never seen an incentive to do so. Here, when you decline housekeeping service, they will give you a $5 voucher for their gift shop. Being we were going to do this anyways, it was a nice bonus. You simply hang a card outside your door by 2 am to let them know. In-room signage offers guests the option to decline housekeeping services and receive a $5 gift shop credit. Of course, the day you check out, they have to clean your room so that doesn’t count, but the other days it does. We stayed for four nights and were able to decline service for three days, “earning” $15 in vouchers for the shop. The small shop offers sun protection, lip balm, hats, Ty beanie animals, handmade greeting cards, candy, snacks, (granola bars, trail mix, etc.) ice cream pints, water, sodas, and more. Additionally, they have a hanging sign in the bathroom encouraging guests to reuse their towels to conserve resources. When I looked under the sink for a hairdryer, I was surprised to find a blue recycling container. This was a fantastic find to be sure; however, I’m not sure how many guests would know to look there to find it. We brought cereal and snacks with cardboard boxes and needed to recycle our Legoland map, so it was great we were able to recycle these items. And while we brought our reusable water bottles, we still had a few plastic Gatorade bottles to recycle. It would be good for the hotel to mention this in the same notice about recycling the toiletry items. We loaded that recycle can; it truly was a great green thing to see. Also, because there was a mini-fridge in our room, we brought yogurt, fruit and vegetables. There was also a microwave. This reduced our reliance on eating out at restaurants for every meal, which also is a healthier and greener way to travel. Again, you can leave your toiletries out for them to donate to others. We were able to see all of these green initiatives during our stay. It was fantastic to think how many guests are able to minimize their impact because Grand Pacific Palisades Resort & Hotel supports and encourages these best practices. Before our visit, we asked about the behind-the-scenes ways they were going green as a hotel and resort to be environmentally conscious and responsible. They planted succulent gardens and indigenous drought-resistant landscaping to drastically reduce the need for watering. They’ve installed smart thermostats and LED lighting which reduces energy usage. They have a committee which works to educate their guests about sustainability and works to reduce waste costs. They offer monthly “lunch and learns” on health topics for their staff. As an organization, the employees are encouraged to give back to their local communities. They continue to do so in many ways. They encourage their employees to give back by helping in their communities. You can see all their projects and the ways in which they’ve helped to learn more. The rental arm of Grand Pacific Resorts is called ResorTime. Every quarter, they donate $2,500 to a non-profit organization. Their guests and others can nominate and then vote for which charity they want to win the donation. Ms. Wagner explained how Grand Pacific Resorts’ leadership team and members of their resort staff works with h2otrashpatrol in their marine cleanup day outings. This paddle boarding video shows some of what they’ve done and how they’ve helped. We choose this hotel due to its proximity to Legoland California. We loved the option of being able to walk to a major area attraction. On the Legoland property there is also the SeaLife Aquarium and the seasonal Legoland Waterpark. What’s great is you can literally walk to Legoland in 10 minutes. Where the crosswalk is from the hotel, you actually cross closer to Legoland (on the other side of the parking booths) than where the shuttle is permitted to drop you off (before the parking booths). So either way, by staying at Grand Pacific Palisades, you will save the $20 it costs to park at Legoland each day. Legoland also has a $30 option to park closer to the park but it really wouldn’t be worth it. We really cannot overstate how wonderful it is to be able to enjoy your morning at the hotel, and then walk over to Legoland to enjoy the full day there. We’ve never seen a hotel offer so much to their guests, both adults and families. We were gone all day, everyday, and unfortunately weren’t able to enjoy their wide range of activities while we were there. For sure, we are hoping we can come back to enjoy some of these fun things to do. Large areas surrounding the adult pool with cabanas, hot tub, lounge chairs, etc. There’s probably even more we didn’t see! View from the second floor looking down at part of the lobby and at the adult pool. This picture isn’t doing it justice! Typically, convenience and price are what people consider when booking a hotel room for their vacations. We want to travel green and be environmentally-friendly, but we most likely won’t take the effort to find a LEED hotel and certified green hotel. So when there is a hotel that so obviously cares about being green, it’s great. The fact that Grand Pacific Palisades makes it so easy for guests to participate during their stay is what makes a big difference. We had a wonderful stay at the Grand Pacific Palisades Resort & Hotel in Carlsbad, California. There was always friendly staff behind the guest services desk and helpful staff in the concierge area. The lobby, room and grounds were clean, spacious, and bright. It was one of the few times where we wished we had more time to enjoy all there was to do at the hotel instead of seeing the sites we came to see. In addition, we felt good about all the ways we were able to minimize our travel footprint, which is often difficult to do when on vacation and especially on road trips. We were really able to travel green this trip. We hope to return to the Grand Pacific Palisades Hotel and Resort this fall to enjoy Legoland again and to explore Carlsbad, Encinitas and Oceanside with its convenient location. California is the all-time great place for your next vacation, many Great Places to Visit in California. Known as “the Golden State” it is one of the most interesting states in America because of its weather, people, bio-diversity and thousands of attractions. It is in this state that you get to see the most fabulous desert scenery, and a few hours later enjoy the shady coolness of the redwood forests and mountain-top views. Yes, California has it all from glamorous Hollywood to the beautiful national state parks. 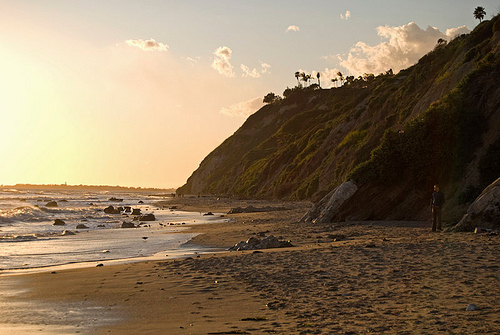 The best way to enjoy the sights and sounds of California is by starting your trip in sunny Los Angeles, the city of Angels and working your way up along the coast. Start off in Los Angeles, as there are& lots of things to see and do here. Explore Rodeo Drive and stroll through the country’s most expensive and eclectic shops. This can be fun even if you only window shop as you’ll see some of the strangest products for sale. While here you must visit Venice Beach, a strange place full of LA’s weirdest and most entertaining people. Enjoy the street shows and the vendors. Once finished, with a day in the sun you’ll want to head over to Universal Studios and get a look at how moves are made. End your day in one of the Santa Monica hotels so you can enjoy the beach, the Santa Monica Pier and the Palisades park the following day. If you’re not much of a camper and want to stick closer to the LA area you might want to consider Long Beach as your next destination. Take a historic afternoon cruise on the Queen Mary, or visit the arts and cultural downtown area. You may even enjoy some time at the Aquarium. If you’re traveling with kids, then you can’t miss out on Disneyland. Let your imagination go wild and discover the wonder of this magical world – the place where stories come to life. This trip makes for family memories of a life time, and Disneyland offers something for kids and adults alike. If your interested in nature and want to spend an inexpensive night on a camp-out drive up toward central California to the Hearst Castle and San Simeon beach. Watch the beautiful sea elephants and sometimes even a whale or two from the bluffs. Take the most scenic 17 mile drive in America following along the Central California coast from Pacific Grove to Pebble Beach. Stop along the Lone Cypress, Spanish Bay and the Cypress Point Lookout landmarks. Stop for lunch in Carmel Bay and you will have spent one of the most enjoyable and peaceful days in the Central California area.